A commercial HVAC system or industrial refrigeration can be large environmental concerns because of the energy consumption and chemicals used in the operation of the equipment. Facility managers can do many things to make their businesses greener. The first way that a facility manager can help the environment is monitoring energy consumption by commercial HVAC and industrial refrigeration units. Cutting down on energy consumption will also cut down on the consumption of electricity and fossil fuels while reducing the cost of operation for the customer. An efficient furnace or boiler will also help keep costs down in the winter. Newer, more energy-efficient air conditioner models or retrofitting older systems will not only help the Earth, it will help save something else green—your money. More efficient units consume less energy than previous generations of air conditioners, which will cut down significantly on energy consumption that will lower cooling bills, especially in those warm summer months. Improving your commercial HVAC efficiency could reduce your heating by 77 percent and cooling by 78 percent, according to the U.S. Department of Energy. One easy upgrade to make for energy efficiency is an investment in new controls. Programmable thermostats allow a commercial HVAC system to be set up so it shuts down or adjusts the temperature during certain times to account for demand or fluctuation. Technology is making it easier to have control of your system and monitor it when you are away from the building with remote access. Having remote access allows you to see when something is amiss right away. Geothermal heating is an environmentally friendly option for heating and cooling that can drastically cut utility bills. These systems function like a conventional heat pump, by using high-pressure refrigerant to capture and move heat between indoors and out. Geothermal systems transfer heat through long liquid-filled pipes installed underground instead of through the air. Another way HVAC impacts the environment is with the chemicals the units use to keep things cool. Air conditioning units built prior to 2010 use chemicals that are harmful to the environment. These hydro-chlorofluorocarbons (HCFC), called R-22, are damaging to the ozone layer. The chemicals take two years in the atmosphere to break down after the HCFC’s are exposed to the sun’s ultraviolet rays. This breakdown process is what damages the ozone layer, which is what protects us from the harmful ultraviolet rays of the sun. By 2030, R-22 will be completely phased out of use. A new chemical, Puron, known as R-410A, used in modern air conditioners, is safer for the environment. The Environmental Protection Agency (EPA) has specific requirements for the handling of R-22 for commercial HVAC and industrial refrigeration purposes. The federal agency also has in-depth regulations for technicians to follow and an exam for refrigerant management. Maintaining your systems with a service contract is another way to be environmentally friendly. Tackling essential HVAC and refrigeration maintenance items such as checking for leaks, replacing filters, inspecting belts and heat pumps will keep you industrial HVAC units running at their top performance. Don’t ignore signs that the air conditioner or furnace needs maintenance. 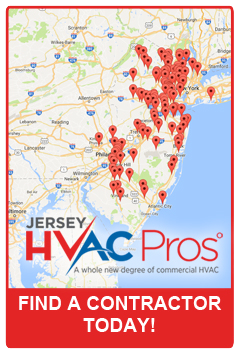 One of the industry-leading 5-Star Seal approved Jersey HVAC Pros can give you expert guidance on the best environmentally-friendly options for your business. Find the Pro closest to you now.